The ASET EIC team is pleased to share with you that we have begun the process of drafting a new RFP for an AZNet III contract. Following AZNet's inaugural term with the service provider Accenture, on March 12, 2012 the State of Arizona entered in to a five-year contract known as AZNet II with CenturyLink (CTL) Managed Services. The CTL contract was extended to September 2019. The new RFP was published on Monday, September 19, 2018, on procureaz.com. Please see a high level timeline below. AZNet II is a consolidated telecommunications program providing State of Arizona agencies, boards and commissions with outsourced voice and networking services and equipment, contracted at a predictable, user-based monthly charge. To learn more about the contract extension, click to read the AZNet II Contract Extension FAQ.pdf. In accordance with Arizona Revised Statutes § 41-712 the Arizona Department of Administration (ADOA) was tasked to establish and oversee a statewide contract for telecommunication services and equipment, known as AZNet - Arizona Network. Following AZNet's inaugural term with service provider Accenture, on March 12, 2012 the State of Arizona entered into a five year contract with CenturyLink, AZNet II. To view the complete AZNet II contract, visit procure.az.gov. Core Decommissioning - Decommissioning legacy equipment from AZNet CORE. UPDATE - 1 device remains to be powered down. Project is 99% complete. Expected completion TBD. We are now in Phase II of this project. The Shared Hosted Data Center opened in July of 2017. We are now in the process of moving all equipment to the new data center. This phase is due to be complete by December 31, 2018. Have a question? Call us at 602-364-1106. 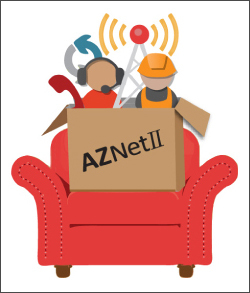 AZNet II is the official telecommunications program servicing all State of Arizona agencies, boards and commissions. Contract oversight is performed by the Enterprise Infrastructure & Communications team within the ASET division of ADOA. See the AZNet II Team page for more information on who’s who within the program. AZNet II employs a pricing structure based on “seats” whereby services and equipment are bundled at a fixed, monthly, per-user rate for the duration of the contract. AZNet II offers a variety of voice seats and networking seats to meet the needs of individual employees as well as the requirements of their site locations. See the AZNet II Resources page for more detailed information about our portfolio of services. AZNet II Oversight Committee meetings are open to all State personnel interested in learning more about the current statewide telecommunication system and helping to drive future AZNet II developments. Hosted by Pam Dreyer and Steve Kalomas, the Oversight Committee meets quarterly at the Department of Administration building on the Capitol Mall. Don’t forget your State ID badge—you’ll need it to pass through ADOA security. Venue: 100 N 15th Ave, 4th floor, ASET conference room. To assist the agencies in cost avoidance, you can make a request for multiple bridge lines to be disconnected. Please complete the spreadsheet in the link below and send it to the AZNet II Service Desk ([email protected]). Within the Carrier Services Award Report for 2013 some one-time cost data was not available, due to numerous agency purchasing systems being de-centralized and ADOA-ASET/EIC does not have access to those systems to retrieve or validate the costs. Beginning in calendar year 2014, we have implemented internal processes and procedures to capture the one-time cost estimates and validate the actuals and they will be published in all future reports posted to this webpage.